Blog Home > DIY and Home Improvement > 2012: The year Brits want to Do It Together! 2012: The year Brits want to Do It Together! 56% of Brits looking to redecorate next year – instead of moving? Doing It Yourself has become a thing of the past as new research from Bosch Power Tools finds that Brits are much more likely to ‘Do It Together’. This new trend is set to spread in 2012 as 56% of Brits claim that home improvements are top of their New Year’s resolution list with spending more time on a hobby and going on a diet following behind. The study also revealed that Brits are a helpful bunch with 78% having helped a friend or relative with their DIY tasks in the past. 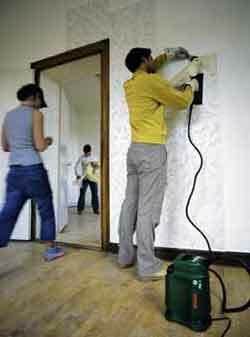 And nearly two thirds take their own power tools along to get the job done – it’s a serious task after all! The findings show that the age old tradition of people being friendlier up North may well be true. 72% of those questioned in the North of England had recently helped out a family member with DIY compared to only 65% of those in London and the South East. And it seems that neighbours are the ones who miss out as shockingly only 34% of Londoners are prepared to assist a neighbour compared to 55% of Northerners. For more information about Bosch Power Tools and projects you can complete with your friends, neighbours or on your own, please visit www.bosch-do-it.co.uk.